There’s something mysterious and tempting about this label with a smoker set in the foreground with Sugar Hill Georgia in the background. 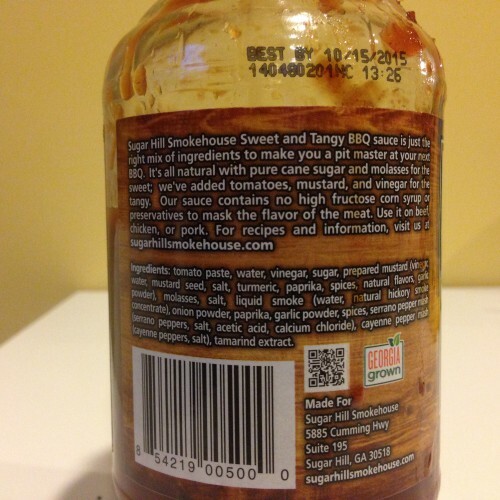 On the outside, we can see the label is quite simple yet easy to read and gets all the major points across – what’s in it, what does it taste like, and is there anything special about it. It has a great name, a high quality label, great colors, and great copy writing that introduces the sauce in a tasteful manner. 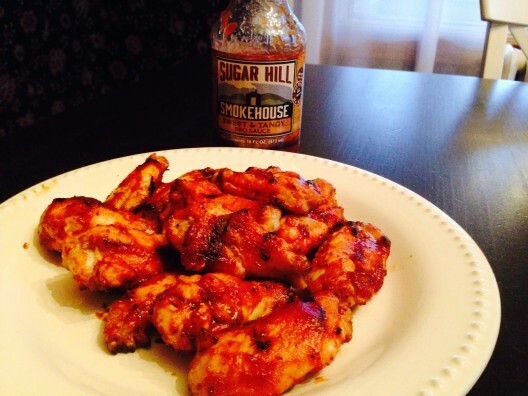 Once I opened the bottle I saw a rust-colored sauce with a natural consistency and thickness. The ingredients are all-natural and somehow it retains the caramelization properties of a sauce with high fructose corn syrups and other unnatural stuff. This is hard to get right. 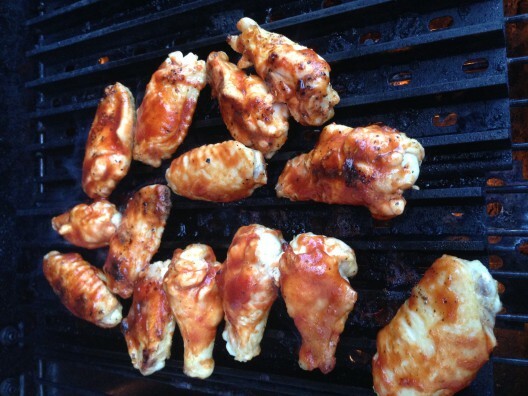 So few sauces can balance great, all-natural ingredients with the right behavior for grilling – that is that it changes slightly, the flavors get stronger, and the sugars brown up a bit when touched by the magic fire of the grill. The flavor uncooked was good but fairly “standard” – but when cooked, the sauce took my tastebuds right to the top floor. The name and the label set the right expectation as the taste is perfectly balanced between sweet BBQ sauce and a tangy mustard. This is a well-executed sauce that tastes as good as it looks and delivers upon its promises. You won’t believe it’s all natural and HFCS-free. That is a very nice label. Their website says they are making a habanero sauce. I hope we see it here on the West Coast someday. Thanks for your comment. I also hope you see the hab sauce soon as well. 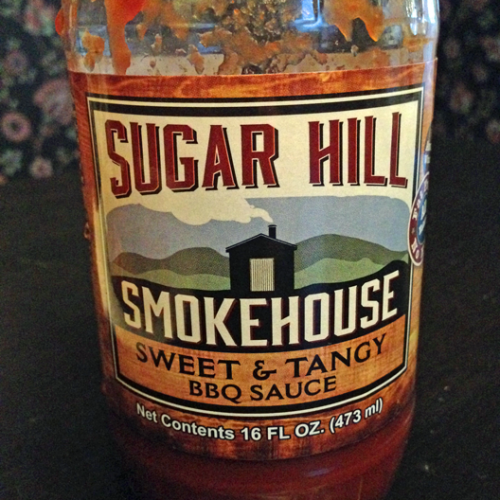 If you would like to try this one, check back with us Friday because we will be giving away 6 bottles of this sauce. Great sauce review as always bro! Definitely adding this to my list of sauces to try out. Looks like my kind of sauce for sure! That chicken looks delicious too! Mustard. Serrano peppers. Tamarind? Wha wha wha wha? What an interesting ingredient list. I was sold at “mustard” as those sauces are hard to come by that actually taste like something other than only mustard. And serranos are a favorite chile pepper for me. The simple label graphics say “try me, I’m not pretentious”. The ingredients say “try me, I’m complex and delicious”. Good point about a sauce tasting one way out of the bottle, and then blossoming after cooking. I’ve had so many sauces that really sing once you cook with them. Thanks for the comment Brian, yes – it indeed was tasty and complex. AND we are doing a 6 bottle giveaway with them on Friday. Can’t wait to get going on the giveaways again!! Great review. Definitely a elixir I want to try. This sauce sounds like a real winner. Like Brian from HotSauceDaily said above, I love that it includes mustard but does not seem to be overpowered by the stuff. 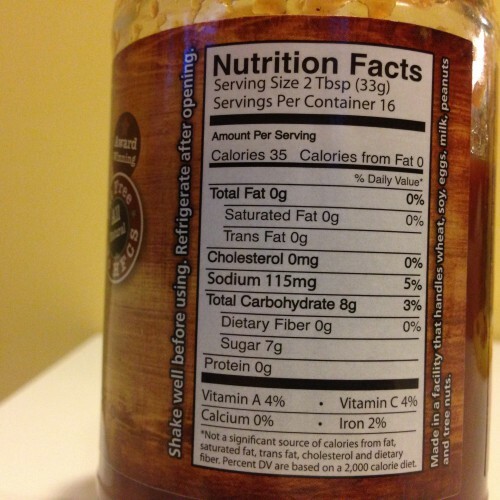 🙂 Also seems there’s no HFCS in this sauce – which for me is an added +1!